Ok, so all that whining I did about my husband breaking a bento box, I take it back. Oh, he still broke a box, but he just spent an exhausting 4 days dealing with snot-nosed, coughy, achy, whiny, lethargic, sick me. I got WIPED OUT by this latest bug. Seriously, I spent all day on Sunday just sleeping, coughing, and sucking on cough drops. I think I mentholated my brain. 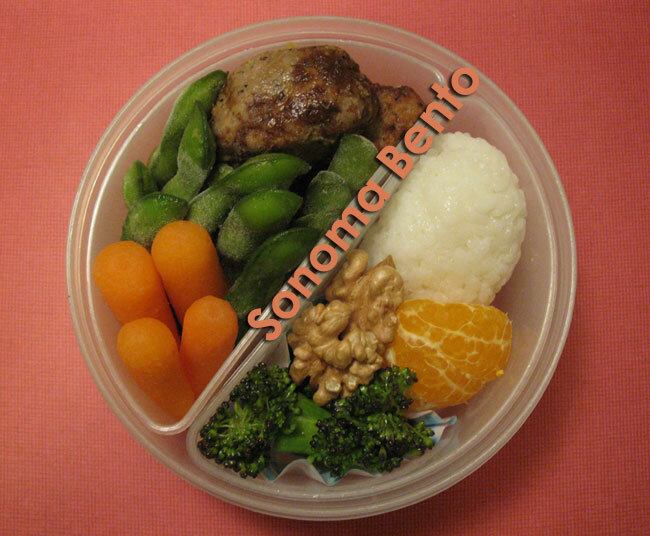 So to make up for it, now that I am finally back to a somewhat-healthy state again, I made a Good Husband Bento. No silly stuff, it's not cute, and I even put it in a plain bento box. But it's filled with yummy stuff and will hopefully be a good lunch for him at work today. In this no nonsense, Good Husband Bento: baby carrots, frozen edamame, Aidell's Teriyaki Chicken Meatballs, steamed broccoli from Triple T Ranch tossed with a soy sauce vinaigrette, a few walnut halves from the Santa Rosa Original Certified Farmers Market, half of a mandarin orange from De'Santis Farms, and a plain salted onigiri rice ball. The poor man even slept on the couch (mostly so he wouldn't get the plague, but also so I wouldn't have to worry about keeping him up all night with my hacking and sniffling)! My bento is similar, although with better lighting. 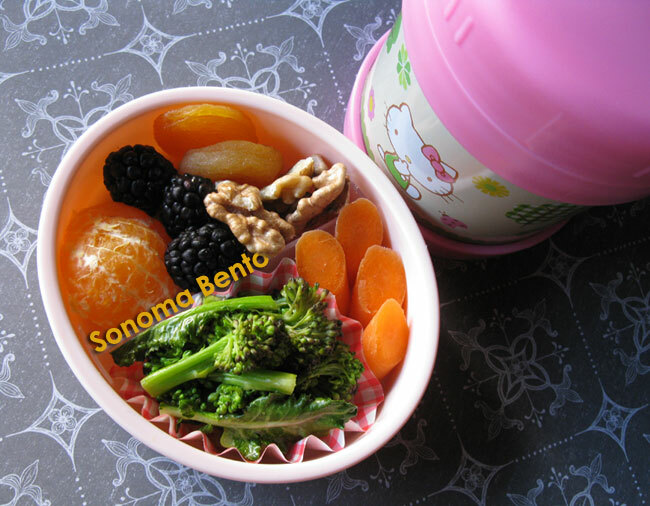 I have a 'side car' bento filled with the other part of the mandarin orange, a few blackberries, walnuts, and dried apricots. Also broccoli and baby carrots. You may have noticed my BRAND NEW Hello Kitty Thermal Jar. Heh heh! Got it while I was in Seattle at Uwajimaya. Today is her first trial run, and I am pretty impressed. I packed it with pretty hot jook at 8:30am (using a recipe from Sheri at Happy Little Bento), and it's still nicely warm at 1pm. I will try to eat earlier when I pack the thermal jar, just to be on the safe side. Oh you wanted to see inside the jar? Here you go! Lots of love to my hubs for being a good guy, who only accidentally ends up in the dog house for breaking something, but mostly deserves yummy bentos. I couldn't wish for a better Valentine. I shared this on Shannon's What's For Lunch Wednesdays. 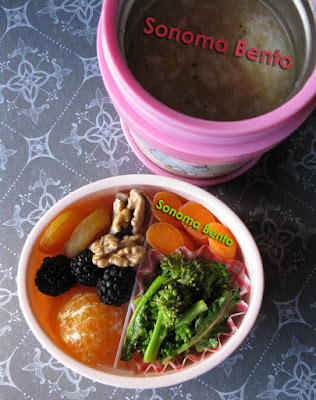 Check it out to see what other bento buddies are whipping up! That's great Michelle! Jook is good for the soul :) That's a cute thermal, and I've heard it insulates very well. Welcome back to health and bento! Thanks, sheri. It was so nice last night to not have a cough drop in my mouth all. night. long. I swear that much menthol (while allowing one to breathe) will do wacky things to one's noggin. Glad that you are back to healthy state! Love that round simple bento box, it makes the food stands out so much! And thank you for the shoutout too!! Thank you Kids Dream Work. I always love packing food into round bento boxes. It just works! Thanks for the tips, Teresa! I've never heard of that remedy. dragonmamma, he smiled at my Hello Kitty thermal jar, but I could see the avarice lurking in the back of his eyes. He will try to steal it from me, I am sure. :) A toolbox bento?! Funny.